So, I tried to use the search function to find anyone talking about the former secretary of the Zetetic Society, Henry Ossipoff Wolfson. Apparently, he wrote a expose on Rowbotham positing that he was a snake oil salesman, in short. He claimed that Rowbotham went by the name of Dr. Samuel Birley, and that Rowbotham was merely using the Flat Earth theory as a cover to hoodwink people. Is there any truth to this story being true, and is there any truth to the claims of Mr. Wolfson (if said story is true)? An interesting question/claim/whatnot. I'll address it in parts - starting with things which are false to the best of my knowledge, and moving on to parts which are true or likely true. I should start by saying that the name Henry Ossipoff Wolfson is a complete unknown to the documented history of the Flat Earth Movement. There is no record of any person by that name having been in the Zetetic Society. This claim of an exposé appears to originate from a New Yorker article, and is made with no reference to a source. Some of the wording in the supposed exposé is very similar to Christine Garwood's phrasing from Flat Earth: The History of an Infamous Idea (which I recommend - it's rather unfavourable towards FET, but the research into the movement's history is of a high standard). I have a sneaking suspicion that Mr Wolfson's words (or even existence) may have been at least partly fabricated. As for his travelling salesman routine, there's a nugget of truth to that. 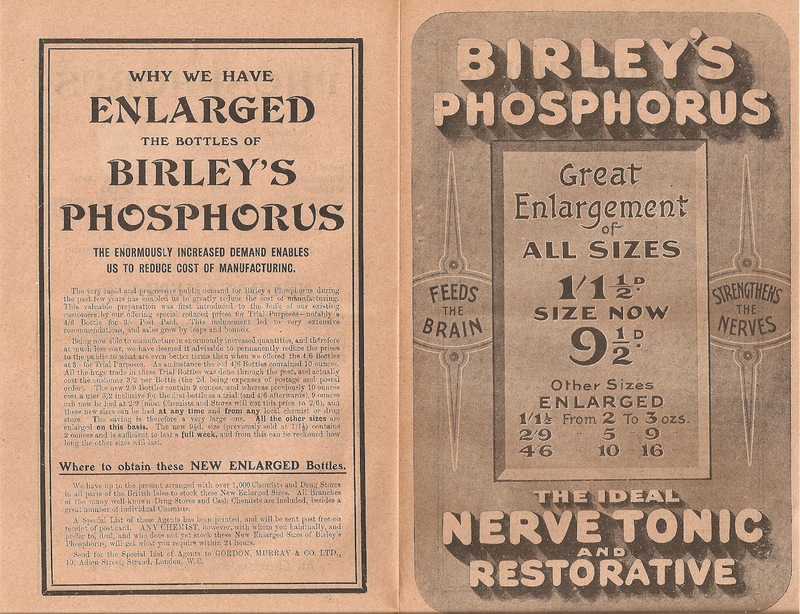 It was widely alleged during his life that he was a quack going by "Dr. Birley, PhD" (of Birley's Phosphorus fame), and that he sold and various products claiming to improve one's health. Did they have the curative properties he was promising? Almost certainly not. 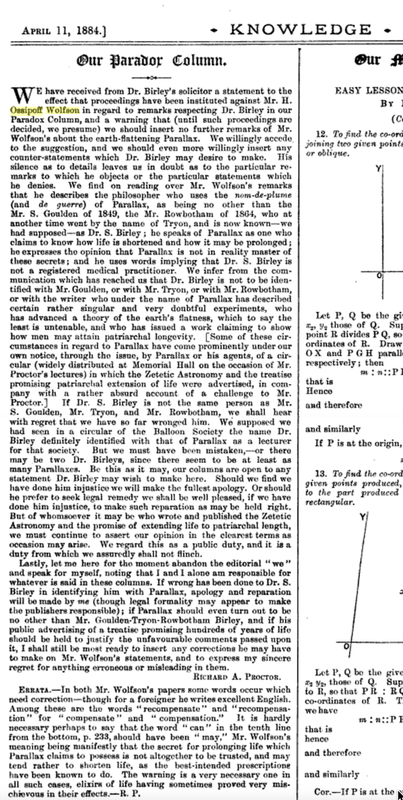 It's hard to say with certainty whether our Rowbotham and "Dr. Birley, PhD" were the same person, but given that Samuel Rowbotham filed multiple patents, including one for a "life-preserving cylindrical railway carriage", I'd say it's at least believable. That said, Rowbotham was many things. He was also a travelling socialist lecturer advocating for a regime change, for example. I wouldn't rush to conclusions about his Flat Earth belief being disingenuous. He was far from a perfect man, and I'm willing to believe that he did swindle people towards the end of his life, but it would be unfair to say that his entire life was a lie. No intentions on condemning his flat earth claims as false. I have just been doing quite a lot of research into all aspects of your community and stumbling upon this kind of caught me by surprise. And yes, the New Yorker article is where I first saw the name of Wolfson. You can't trust anything you read on the matter. Insults and character assassination is the best evidence they have. Rowbotham's wikipedia page says that he dropped out of school at the age of 9. The American Association for the Advancement of Science lists him as Dr. Samuel Rowbotham in his 1885 obituary, as does the obit in Eng. Mechanic and World of Science. The Bookseller obituary confirms he was a practicing doctor of medicine as a "legitimate profession with immense success." Rowbotham's work is cited in medical texts. This is cited alongside other evidence-based benefits of phosphorous by other researchers. Could someone tell us how Rowbotham went his entire career pretending to be a medical doctor and treated people with medicine, medicine that allegedly doesn't work at all no less, and how he got away with it, especially with all of the scrutiny he was under by the entire world? Hence my suggestion that there might have been two individuals whose histories got tangled together. I'm not fully convinced that this was the case, but it does explain some discrepancies. I found this eBook, as well. Also this paper which was published in 2001 at the University at Leicester references Wolfson. 233; R A Proctor: ‘Note’ Knowledge 5(1 6 May 1884), 355." I can find no referenced source that says he actually dropped out of school at the age of 9. Seems a bit ludicrous. The above physician is not Rowbotham. But we see that phosphorous was asserted by traditional academia to cure or treat hopeless cases of disease. Hopeless typically means that medicine can't help you. There are numerous phosphorous references in that text, for that and other ailments. We must ask: Why are physicians lying on Rowbotham's behalf? With some of the references being from before Rowbotham was even born? So, I would agree that phosphorous is an essential mineral in the body given its role in bone formation with calcium and other regulatory functions, but I haven't found any real research showing that phosphorous itself is used as a cure for any diseases. Its that point that the accusations of a snake oil salesman would come into play. Due to the fact that if a person is low on phosphorous due to some disease which prevents phosphorous from being taken into the body during consumption of food, taking phosphorous as a supplement would obviously provide an improved outlook on health - but one would need to continue taking said phosphorous - it would not be a cure. Albeit, I did not take the time to look into what Rowbotham was claiming phosphorous could do. My assumptions, considering that he did this in later years, was not to mislead anyone, but he, himself, was taking it and felt better. Therefore, he decided to sell it to others. Not a good or bad thing to do. Gotta pay the bills. A list of cases appear here. Rowbotham's advertisement of his product as a nerve tonic and restorative appears to be true. Can someone look at these sources and tell us that phosphorous does nothing for no one? 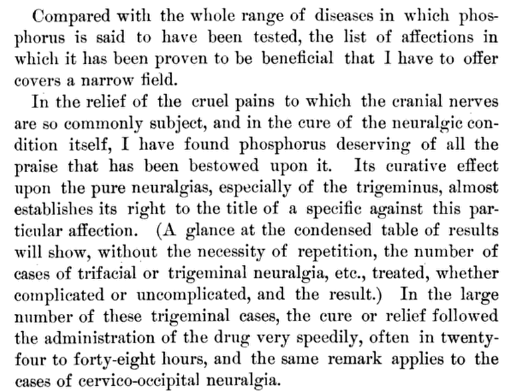 Uh Tom, that ANA volume was published in 1875, do you have any current sources that attest to phosphorus' value as a "nerve tonic," I'm not saying it doesn't have nutritional value, it certainly does, it's just that all my searches of phosphorus' use in medicine have only related to its use in diet as a supplement. Also, everytime I click on your link to lists of cases, it tells me Error 404, is that just my computer, or are others facing similir problems. See a general theme here? The unnamed doctor doesn't say the dosage and Rowbotham "forgot" his formula even though he cured a patient with it. Considering what they've done with it, you'd think they'd try to give as much info and documentation as to the specifics of their phosphorous cures so other doctors could try using and adapting it, but unsurprisingly, they basically just say phosphorous cured the patient. Sounds sketchy, with some hints (not proof) of quackery. Also, if you read the sentence right after the description of Rowbotham's phosphorous doings, the author himself thinks it's a medicine to do away with. You said yourself this is a medical text, the author himself is probably a doctor, and here he's presented with all these cases of phosphorous cures, yet he's dismissing it. That can't be without reason. Interesting read. Maybe to Pete's point. Murky still. Richard Proctor is a famous astronomer. Why is he whining about any of that when he could just prove FET wrong? The fact that he is at the stage of questioning the credibility of the author shows that Rowbotham proved his position. Truth doesn't have an expiration date. Phosphorous isn't used anymore. Today doctors are told in medical school to give pain killers and pharmaceutical drugs at $10 a pill. Phosphorous used to be used as medicine, however. It is impossible to read those sources and say that phosphorous was never used or that it has never done anything for anybody. Its use in medicine as treatment is undeniable. If you are unable contradict those sources that Phosphorous was used as medicine by doctors of the era then you are unable to call Rowbotham a snakeoil salesman. Richard Proctor is a famous astronomer. Why is he whining about any of that when he could just prove FET wrong? I have no idea what Proctor was on about, nor the context. 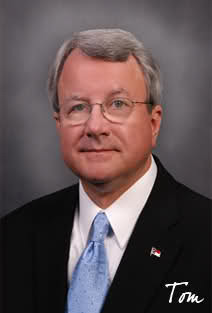 I just searched on Wolfson's name and this came up. Thought it was interesting, to Pete's point: Were Parallax, Rowbotham, Birley all the same guy? The fact that he is concerned about credibility shows that Rowbotham proved his position. I don't think this has anything to do with anything, proof or otherwise. Tom, this should be your signature, "It has taken nearly three centuries to reconcile certain phenomena with the theory of rotundity, and scores of them still remain unreconcilable." Brilliant, scathing, I wish I could write like that. Try reading this. Sorry. Its quackery. Clearly cited sources and everything. If you Google phosphorus medicine, literally the only thing you get is homeopathic remedy websites. In the history lesson in the link, the "medical literature" at the time cited it as a cure-all for anything from sexual impotency to tuberculosis. Does that provide enough evidence? If you want to have a discussion on homeopathic remedies and how real it is, we can end this discussion now. You need to provide evidence that phosphorous doesn't work, not belief. Are all the physcians who have used it in practice with success lying then? Are all of these case studies lies? An article where someone believes it doesn't work, or a quote someone who admits that their own experience with phosphorous was limited, but who believes that it probably would not work is not evidence. Have they conducted trials with it? Have they shown it to be ineffective? If not, then such a statement is not evidence. Maybe they just think that drugs and pain killers are better. You are calling the doctors who have reported success with phosphorous liars. And that their claims and case studies of resolving some medical conditions rapidly with phosphorous as false. Prove it. Where are the evidence-based studies showing phosphorous to be useless for anyone? An evidence-less quote or opinion by a drug pusher means very little in the face of evidence that it does work. If you scroll up in his text the author is describing in the previous section how very poisonous phosphorous is if used incorrectly. He's not calling those doctors who claim success with it liars. But you are. You keep citing studies that are not even relevant in the modern medical community. Are you going to start citing bloodletting with leeches next? Theres tons of medical research from that time period showing its effectiveness, too. There are no medical uses for phosphorus to treat an externally acquired disease. It's only used as a supplement to increase low phosphorus levels. Tom, provide me evidence from a recent medical journal, say in the last 50 years, that shows the efficacy in treating any disease with phosphorus.